Wow, the creative sparks have really been flying in the last year or two, but I have been quite neglectful in sharing the enthusiasm and energy with you! Exposing Rhythms, was an opportunity to review, reflect on, edit, and hang my work with my friend Fred Neudoerffer. I am so grateful that Fred, seeing my work hanging in the studio, realized it would be so well complimented by his stunning Hudson River Movements photography series. Now that my art was calling to me to be hung in public, I entered a couple of chine colle pieces in LARAC member show and won an Honorable Mention award! Window Shop Gallery, an effort to share art in the heart of Cohoes, made possible through the efforts of the Choose Cohoes for Art Committee, chose me to share the spotlight with miChelle Vara and Luba Ricket , while at the same time being the featured artist at the annual Cohoes Artist Showcase. Niche Gallery in Saratoga does wonderful shows to benefit local charities. A show entitled “Memory: Recognition of the Past” gave me an opportunity to show some work from an on going series of photographs that I am passionate about capturing below the Cohoes Falls near my studio. Two pieces sold at the reception! With the encouragement of friends I took my art to the street at The Stockade Art show. What a great experience to meet so many art admirers. I love teaching my unique technique for monoprinting with dye on to silk scarves, but my “day job” keeps me from offering too many classes, but this year not only did I have a great group of artists come play at my studio from Schenectady Art Society but I was also invited to teach 2 days at a wonderful retreat for WWAM. In my spare time I work a full time job, as Merchandise Team Manager for a national retailer. It’s demanding, fast paced, and actually a great job where I can be creative in merchandising all kinds of stylish products, but also necessitates being creative in juggling multiple priorities and logistics! Best thing about it? My awesome team, we all really love having a project to dig in to. Ahh, but change is afoot. My store will close, the team will be dispersed. I am excited that I have been chosen to move on to continue as a MTM in a nearby branch, that does over 5 times the sales volume of my small store! 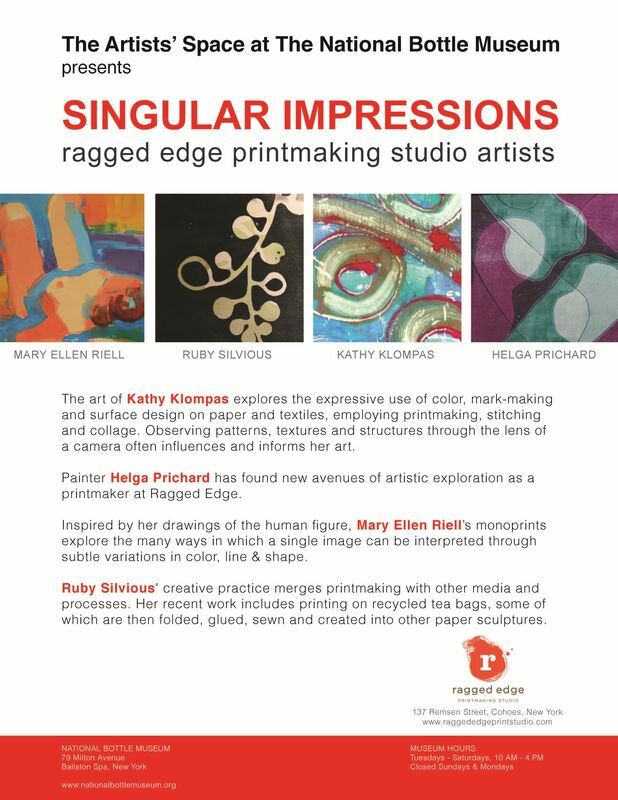 I am still the proud owner of Ragged Edge Art Space in Cohoes NY, a full green printmaking facility which has become the creative home for a great group of artists. It’s such a cozy space, that with the companionship of my three studio partners, Ruby, Helga, Mary Ellen it’s easy to just stay solely absorbed in the art making. But it is time to throw open the doors, and let our welcoming light shine. I truly would love to have more folks sharing in this collaborative effort. 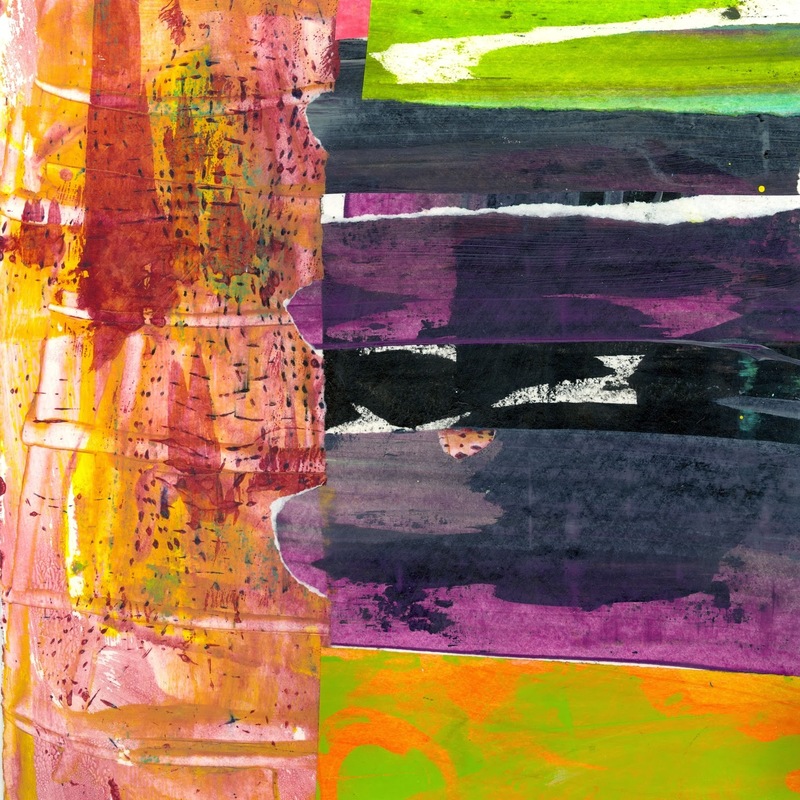 After a class with Jane Davies a year or so ago I am just loving working with all the juicy possibilities of painted paper collages. 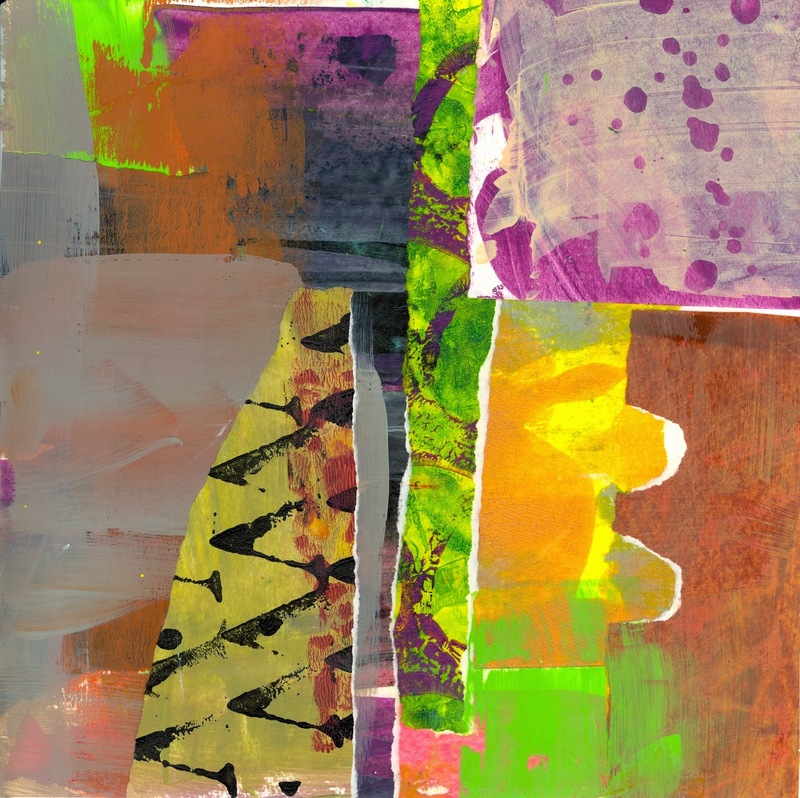 After a playful spree of intense color-mixing and mark-making, I gather the patterned papers and set out to find a way for them to sing in harmony. A determined dance of trial and error, discovery, contemplation and universal energy come together to form these visual puzzles. These two, “Query” and “Resolution” made their way in to the 3rd Annual Juried Upstate Artists Show at Laffer Gallery this past January.